As we come closer to the end of the year, life gets busier and busier and it’s easy to neglect our dental health. There’s just so much going on with Halloween wrapping up and Thanksgiving around the corner, the holidays will be here before we know it. Halloween has just passed us by and the kids probably have loads of candy hiding all over the house. As parents, we have to make sure we are careful about our children’s candy consumption. I have three children under the age of 6 and they love candy. Even as a dentist, I don’t “outlaw” candy in my home, instead, I regulate it. The real trick is to make candy a treat, and not a normal everyday habit. Make sure that after the kids have candy they rinse really well with water. If it’s the end of the day, make sure they brush really well. I always tell people, it’s not the candy that causes damage, it’s the candy lingering on the teeth for hours untouched, that provides food for bacteria, which in turn, produces acid that destroy the teeth. Bottom line, hide that candy and give it out in small portions over a period of months! Moving on, Thanksgiving is a holiday that revolves around good food. Everyone is looking forward to that delicious family dinner. However, there are many people that can’t enjoy that meal because of painful tooth problems. In our society today, there is so much emphasis on cosmetics that people tend to forget that the most important aspect of your dental health is a fully functioning bite. 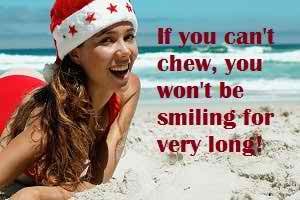 If you can’t chew, you won’t be smiling for very long! I can’t tell you how many people come to my office and want to fix up their smile while ignoring the problems on their back teeth. The typical answer is, “Doc, you can’t see it, and it doesn’t hurt right now, so let’s just work on the front one.” This is a dangerous mentality. A fully balanced bite, with healthy chewing teeth is the only way to achieve good long-term dental health. A lack of chewing teeth leads to a number of problems – first and foremost is poor diet. If you can’t properly chew meats, fruits, and vegetables, you tend to be forced to make unhealthy choices about your diet. This leads to a diet of more soft, processed foods; an issue that will affect your overall health as well as your dental health. It can lead to diabetes, obesity and a host of other problems. The second consequence is that your front teeth end up taking a lot of stress that they were not created to endure. Front teeth are for tearing and biting into foods, they are not built for chewing! So when we have poorly functioning back teeth, or worse, no back teeth, the front teeth now take on stresses they were never meant to handle, which ultimately leads to chipping, and fracturing, and ultimately…dentures! If you require some dental work and have been putting it off, don’t panic! There is ample time before the end of the year, but call your dentist as soon as possible, as schedules will start to fill up quickly. If you have dental insurance, don’t forget, it typically runs on a calendar year and it doesn’t roll over. That means that if you don’t use your insurance max this year, you lose all the money you haven’t utilized. Paying your monthly premiums but not utilizing your benefits is a waste, and it’s exactly how insurance companies make money! But that’s not what modern dentistry is about. You took the first step and came in for treatment, so don’t focus on the past. The goal now is to get you healthy and smiling again.